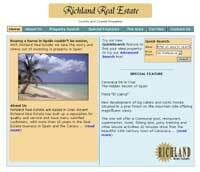 Richland are a real estate agent based near Alicante in Spain. They needed a website that allowsed their visitors to search through their rapidly expanding portfolio of country and costal properties. Another inportant part of their requirements was that they needed the ability to manage their properties on the website themselves as these changed daily. Using the lastest technology available, Microsofts ASP .NET, we created a dynamically generated website that recalled the list of properties from the online database which is filtered by the website users search criteria. The second requirement was met by adding our Content Management System to the site. This allowed them to add, edit and delete properties by a secure password protected web interface. The Content Management System also allowed them to edit other areas of their website, such as a special features section and a car hire section.